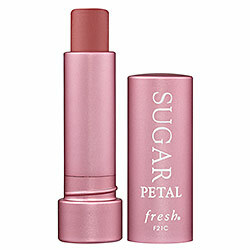 I’ve posted about Fresh Sugar Lip Treatment before, HERE and HERE, and my opinion stands that some of these colors and formulas are great and others not so much. What I mean is that, some of the colors take away from the formulation, they are too gooey and run easily, and its not so pretty. So at that Bachelorette party I went to a few weekends ago, the bride-to-be Leah, whipped this out and was like Ilana I think you are going to like this. Duh, it was a lip product. So I ripped it out of her bridal hands and put it on. I was in love, this was the perfect sheer your lips but way better color. It was not berry, not red, not pink, just perfect lip enhancement. Super low key, effortless but enhancing. So, like I said some Fresh Sugar Lip Treatments are better than others. This is totally one of those. The formula is harder and more consistent than other colors namely Passion and Rose and the color does not bleed outside of your lips. But Petal is seriously such a great color. If you are looking for a low key lip, thats easy to maintain look no further, Petal nails it. Yesss, absolutely agree with you! I have the shades Passion, Berry, and Petal. I love em all, but Petal is perfection in a tube. It totally is the BEST most flattering color. Love it! Especially for summer, low key is where its at.